As we return from Thanksgiving break – refreshed and ready for the final weeks of the fall term – I want to take a moment to express gratitude for our students, staff, faculty and alumni. One of my favorite duties as provost and senior vice president for academic affairs is working with inspirational colleagues who are dedicated, hardworking and generous. Earlier this month, I hosted the Academic Affairs Staff Appreciation Breakfast with the division’s leadership team – a great opportunity to see our staff members come together and to hear from their supervisors about the great work they do each day. This year, we invited peers to share positive stories about their colleagues. The shout-outs, as we called them, highlighted the many great things I see in our hardworking staff – greeting students with grace and enthusiasm; going the extra mile; acting with patience and good humor; seeking ways to help colleagues. I also had the honor of recognizing some of our longest-serving employees at the 50th Spartan Service Celebration, where 116 Spartan staff members were recognized for service milestones. I was moved by videos during which honorees shared personal memories. An especially poignant story was Jack Harding’s. Jack began working as a lab technician 35 years ago in the aeronautics department (now Aviation and Technology) and since has moved on to become a telecommunications network analyst in IT. Jack’s two sons grew up on our campus, regularly attending football games and campus events. Both eventually enrolled here as college students. His oldest son, Jack Jr., joined the Marines after graduation, following in the footsteps of his father and grandfather. He was welcomed back to the campus in 2011 when Jack Sr. and his wife were invited to present his lieutenant stripes in a stirring ceremony. 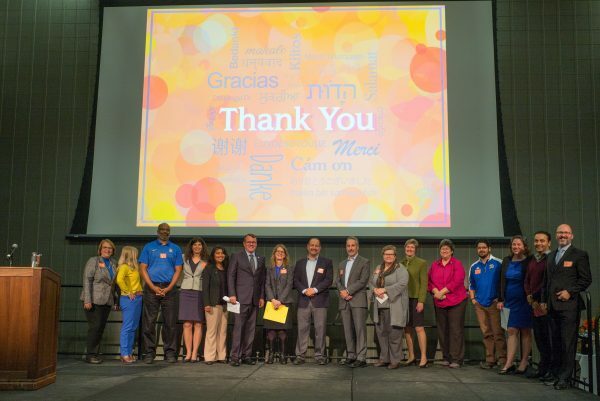 All of our staff – whether they have served SJSU for months, or decades – deserve our support. That includes professional development opportunities; I am pleased that we have the resources this year to again offer the Staff Professional Development Grant Program. These stipends allow staff members to develop skills that can enhance their capacity to serve our students. We have approved 229 proposals to date, and hope to issue another call for applications in early spring. Many members of our campus community “pay it forward” by helping those following in their path. 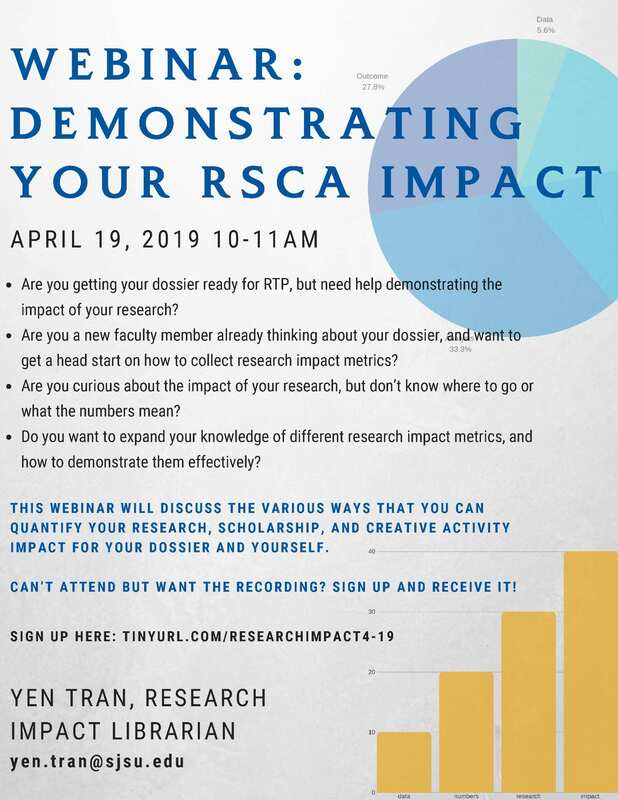 This includes our Emeritus and Retired Faculty Association (ERFA), which created a research, scholarship and creative activities (RSCA) grant program to help current faculty members advance their professional growth. 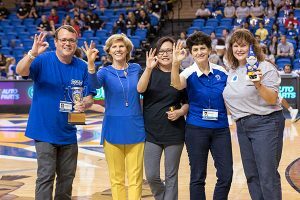 Last year’s recipients included Anthropology Department Assistant Professor AJ Faas and School of Social Work Assistant Professor Nicole Dubus. Another reason for gratitude is the many alumni whose financial support helps current and future students achieve their goals. A generous gift from Marion Cilker, ’39, established a scholarship for students interested in infusing arts into education and funded an annual conference. While Ms. Cilker passed away in 2012, her generosity lives on, supporting current and aspiring teachers seeking ways to incorporate art into diverse curricula for K-12 students. Students also are benefiting from strategic collaborations. A partnership with nonprofit Braven Bay Area fueled a program for first-generation, underrepresented minority students that connects them with community mentors at high-tech companies and nonprofits and develops personal skills for future career searches. These are just some of the people, programs and connections that are empowering us to power student success. In this season of gratitude, I’m especially mindful of your remarkable contributions. Thank you! The Author and Artist Awards on Nov. 3 celebrated the work of 39 Spartans who completed significant publications or performances in 2017. The evening event this year was held in the Dr. Martin Luther King Junior Grand Reading Room on the eighth floor with President Mary Papazian offering opening remarks while Provost Andy Feinstein shared some closing thoughts. 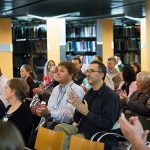 The annual campus event sponsored by the Office of the Provost, Office of Research, Spartan Bookstore and University Library is designed to recognize faculty and staff who have recently published a book or other major works of general interest and significance. 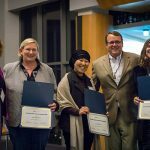 At the celebration, authors and artists from all seven colleges and multiple disciplines were recognized, including Feinstein who is the co-author of a hospitality textbook, Purchasing: Selection and Procurement for the Hospitality Industry, that was updated this year. “Your work supports our students by providing up-to-date textbooks, by enhancing your disciplines and by generating new creative efforts such as musical recordings, literary collections and live performance art,” Feinstein said. 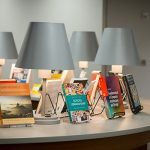 “I have enjoyed learning about all the pieces written, composed or edited by faculty and staff members completed in 2017 and sharing a bit about my updated hospitality textbook. All publications are now listed in SJSU ScholarWorks. Many are also available at the Spartan Bookstore.More photos can be viewed online.